After experiencing a period of economic deadlock imposed by the unsettling situation in Iraq and the Middle East, the Kurdistan region is regaining its former status of being the bustling business hub of Iraq. Owing to its liberal business environment that favors local and international private investment, a population of nearly 5.5 million accounting to a large consumer market, and a marked insufficiency to satisfy local demand, the Kurdistan Region harbors the right elements to attract foreign investments and build strong trade relations. 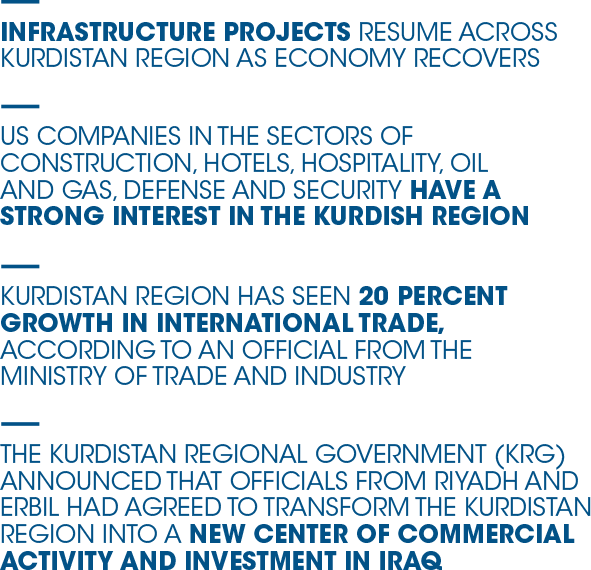 As a matter of fact, the trade sector is one of the key drivers of economic growth in the KRG and Iraq at large. According to the Kurdistan Board of Investment, imports account for 85% percent of the estimated US$5.0–5.5 billion of annual external trade in the Kurdistan Region, with Turkey being the largest trade partner, dominating multiple sectors including construction. The KRG struck a 50-year energy deal with the latter that also covers gas exports to Turkey as of 2017, based on previous plans. A survey conducted by the Ministry of Trade and Industry revealed that 94% of the KRG’s business transactions involve 15 countries, and categorized imports into 21 clusters led by electronics, iron products, followed by food products including groceries and poultry. The investment law covers all economic sectors except oil and gas. * Provision of land plots for subsidized lease. * Provision of public infrastructure to the project fence. * Exemption from corporate taxes (10 years) and customs duties (5 years). Since 2014, the fight against terrorism and the financial crisis have crippled Kurdistan’s economy as numerous business and construction projects came to a halt, especially in Erbil. However the city is starting to regain its former glory as the Kurdistan Region’s Council of Ministers has decided to provide a budget to commence over 2000 projects in Erbil that were paused, according to Kanaan Khailani, a member of the Erbil Provincial Council. “A significant business movement has begun in Erbil, and the Kurdistan Region Council of Ministers’ current budget decision will boost the Region’s business in general and restore the economy to the previous level,” said Khailani. 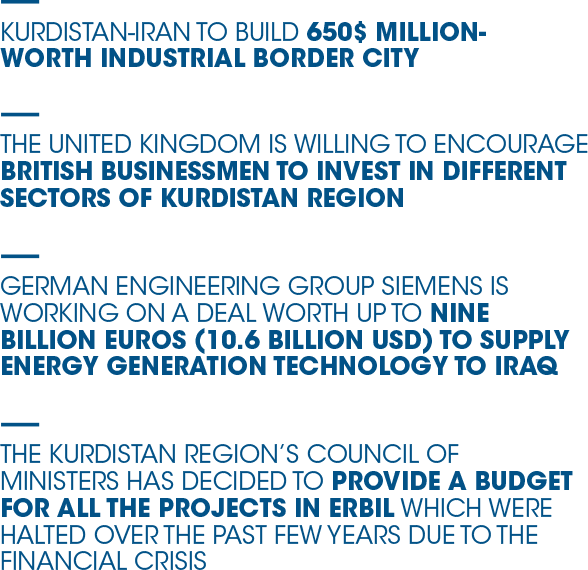 Erbil’s improved relations with Baghdad and neighboring countries are also expected to mobilize its economy and attract local and foreign investment within various fields. Mosul is one of the cities that endured the most damage in recent years, with 54,000 houses in and around the city being completely destroyed. The Norwegian Refugee Council estimates that $874 million is required to repair basic infrastructure in Mosul. Since July 2017, numerous reconstruction projects in Mosul were initiated by government organizations and NGOs however the city only received $252,000 in funding between 2017 and 2018. Much investment is required for reconstruction and development projects including basic infrastructure, hospitals, schools, and residential buildings.